Every year around the world, nearly 2.8 million lives are lost due to work-related incidents and diseases. Creating safer workplaces is of absolute paramount, as is realizing the importance of independently certified health and safety management (OH&S) systems. In January 2018, ISO 45001 was approved following an overwhelming final vote of 93% by the ISO member National Standard Bodies (NSBs). OHSAS 18001 will be withdrawn upon publication of ISO 45001:2018, which is expected in March 2018 and there will be a three-year migration period from the date of publication. 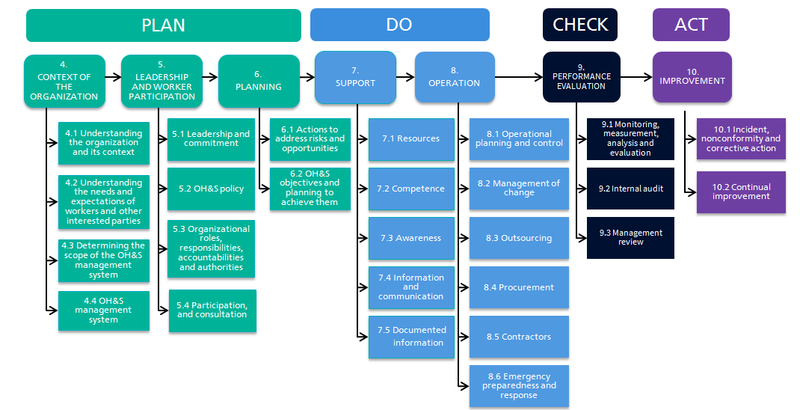 Manage their OH&S risks and improve their performance to help make people safer and healthier. Demonstrate they have a robust OH&S system in place and will recognize that they have achieved an international benchmark – which will boost their reputation to customers and employees alike. Ensure they have a robust system to comply with OH&S regulations. Benefit from Fewer accidents, less absenteeism, lower employee turnover rate, better morale. Benefit from reduced disruption to operations in terms of time and cost. More easily integrated ISO 45001 certification with ISO 9001, ISO 14001 and other standards that follow the new High Level Structure found in Annex SL. Benefit from a stronger focus on the context of an organization. Organizations will need to consider the health and safety issues that directly impact them and also take into account the wider society and how their work may impact on the surrounding communities. Benefit from increased top management involvement and greater participation of workers in the development of policy and systems; the role of health and safety will no longer be the sole responsibility of the Health & Safety Manager. Why choose LR for your ISO 45001 Certification? Trusted experience – LR has been a market leader in OHSAS 18001 certiﬁcation and training for years, and more than half of the world’s top 200 companies choose us. Technical expertise – Our health and safety technical specialists were instrumental in the development of OHSAS 18001 and ISO 45001. Our assessors and technical specialists have some of the most extensive health and safety assessment and training experience in the world. Many are hand-selected to provide input into the work of the ISO technical committees and are able to provide first-hand insight into requirements of the standard and the standard’s logic. Proven client satisfaction – Year after year, our clients continue to report overall satisfaction rating of our service and technical support. Your business helps LR to help others – With no shareholders of our own, we are independent and impartial in everything we do. We are committed to acting with integrity and objectivity at all times. The profits we generate fund the Lloyd’s Register Foundation, a charity that supports engineering-related research, education and public engagement around everything we do. All of this helps us stand by the purpose that drives us every single day: working together for a safer world. Assessment methodology – We help you manage your systems and risks to improve and protect the current and future performance of your organization. Our approach is built on three pillars and extends the focus beyond the certificate to an assessment approach designed to help organizations meet their strategic objectives. This is why we’re confident that we can will help organizations of all sizes transition from OHSAS 18001 to the new ISO 45001 standard with ease as well as help organizations that are new to ISO 45001. ISO 45001 Training – we offer a wide range of ISO 45001 training to help your team understand requirements, prepare to transition, support implementation, manage and audit your system.